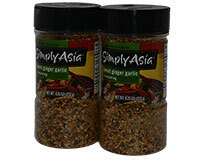 Simply Asia Sweet Ginger Garlic Blend is a mixture of sweet and savory spices that produce authentic Asian flavor with meats, seafood, vegetables, noodles, rice and stir-fry dishes. Ingredients: Spices (including Ginger, Toasted Sesame Seeds and Black Sesame Seeds), Sea Salt, Unrefined Sugar, Garlic, Red Bell Peppers, Toasted Coconut (Coconut, Sugar, Dextrose and Salt), Soy Sauce (Soybean, Wheat, Salt), Onion, Natural Flavor, Sulfites and Extractives Of Paprika. Mix 1 cup of water, 2 tablespoons of Sweet Ginger Garlic Seasoning, 2 tablespoons soy sauce and 4 teaspoons of Corn Starch. Heat 1 tablespoon peanut or canola oil in a skillet on medium high heat. Add 3 1/2 cups cut-up vegetables; stir fry for 3 minutes. Remove vegetables from skillet. Heat an additional 1 tablespoon of peanut or canola oil in skillet. Add 1 pound of boneless, skinless chicken (cut into strips); stir fry for 5 minutes or until cooked through. Return vegetables to the skillet and stir the seasoned sauce mixture, and then stir the seasoned sauce mixture into the skillet, stirring constantly. Boil for 1 minute or until sauce has thickened.